Albareh Art Gallery, Adliya, is hosting an exhibition today and tomorrow titled Au Pays des Mollahs (‘Mollah’s Land’), which showcases paintings by Iranian-Canadian artist Sayeh Sarfaraz. A special Swiss gourmet feast will be available every day until March 7 at the Mövenpick Hotel Bahrain’s Silk restaurant in Muharraq. This includes classic Gruyere and Vacherin cheese melted in a white grape beverage. There is also Fondue Bourguignon served with beef cubes and a wide range of other fondues. The menu costs BD15++ per person and is available from 7pm. A ‘Berber Women of Morocco’ exhibition is being held at the Bahrain National Museum, Manama, until April 15 as part of the 2015 ‘Year of Heritage’ festivities. It is open from 8am-8pm. The exhibition will showcase a wide range of objects and photographs in tribute to the women who preserve the Berber culture’s identity. The Dilmun Club, Saar, will be hosting a kids’ disco and bingo every Wednesday. It runs from 5pm-6.30pm and costs BD2 per child inclusive of a buffet and soft drink. Both members and non-members are welcome, with normal guest fees applied. For more information, call reception on 17690926. The Royal Country Club’s Family Movie Night takes place in the gardens from 6pm. All are welcome to attend and entry is free. The Ramee Grand Hotel & Spa, Seef, hosts a Seafood Night every Thursday at its Lemon Tree restaurant. On offer are lobsters, shrimps, octopuses and more. The cost is BD14++ for adults. The lights will be shining bright at Bahrain International Circuit tonight when the latest edition of National Race Day takes place in Sakhir. The event is set to feature double the action with both the BIC 2,000cc Challenge and the BMR 600 Championship battling it out under floodlights along BIC’s 2.55-kilometre Inner Track. Tickets can be purchased at the gate costing BD2 for adults and BD1 for children. The event is being organised by BIC in cooperation with the Bahrain Motor Federation and the Circuit Racing Club of Bahrain. Action in the BIC 2,000cc Challenge begins at 4.30pm with the Free Practice session. It will be followed by Qualifying starting at 5.35pm. Race One is scheduled to flag off at 8.03pm, while Race Two will begin at 9.23pm. Both will be held over 15 laps. Meanwhile, the BMR 600 Championship, which features identical Honda Hornet 600cc bikes, will be holding round three of its 2014/2015 championship, which is also its maiden season. The BMR 600 Free Practice begins at 5.10pm, while Qualifying is scheduled for a 6.20pm start. Race One is slated for a 7.31pm start while Race Two flags off at 8.51pm. For more information visit bahraingp.com, or call 17450000. The Baharat restaurant at Le Meridien Bahrain City Centre is hosting a ‘Fizz Fare’ brunch every Friday from 12.30pm-4pm. To celebrate Valentine’s Day, the February 13 brunch will see the restaurant decorated with heart shapes and will feature a special performance of ballads by popular jazz duet Two Blue. A chocolate heart and a gift will be given to all the ladies as a memento of their day. The fizzy brunch costs BD30 net, the soft brunch costs BD20 net, kids between six and 12 are half price, while kids below six are free. Head to the Royal Golf Club for its Links Friday Carvery Brunch, which includes a range of starters, live cooking stations, traditional carved meats, desserts and more. There’s also a special section for children. The brunch, from noon to 4pm, costs BD18 net for adults, including unlimited selected soft drinks, and BD27 net for adults, with unlimited selected house beverages. It’s BD9.500 net for under-12s and children aged four and under eat for free. The Lemon Tree, at the Ramee Grand Hotel & Spa, Seef, hosts a Friday Family Brunch from noon until 4pm. The buffet includes dishes from around the world, including Middle Eastern favourites, plus live cooking stations and entertainment. There are also activities provided for children. The brunch costs BD18++ for adults and BD9++ for kids. The Bahrain Farmers’ Market is being held at the Botanical Gardens, Budaiya, from 8am until noon. The Manama Souq, one of Bahrain’s oldest and most iconic districts, is set to undergo rediscovery for the modern age courtesy of the Bahrain Noor El Ain Festival. The ‘Souq Explorer’ takes place on Friday and Saturday and is the first of its kind. Registered teams of three members each will embark on a race on foot to explore the souq’s winding streets and unique shopping atmosphere to complete a scavenger hunt challenge. Each team’s journey will be recorded by a Go Pro camera and uploaded to a giant screen at the start/finish line for visitors to see, as well as to social media channels. The teams will have a map of the souq and will be required to purchase some easily-found items at the lowest price and in the shortest time possible out of a 45 minute allowance. 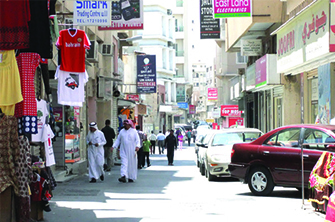 Teams will have to race to complete the challenge using only the available clues and renowned souq bartering techniques. Registration is now open for participants to sign up online by emailing info@bahrainnoorelain.com and registering their teams and then paying BD15 per team on site at the Manama souq to confirm their selected timeslot, which will be returned as their challenge spending money. For further information visit www.bahrainnoorelain.com or call 17000710. T-Spoon Café at the Westin Bahrain City Centre is offering a personalised cake promotion in anticipation of Valentine’s Day. You can call the café to order a Red Velvet cake with either a message or picture of your choice to be printed on top by the pastry chef. Reservations are now open until February 12, with collections available on February 13 and 14 from 9am-11pm on weekdays and 9am-midnight on weekends. It costs BD 9++ for a 500g cake. The café has also established a Valentine’s Tree of Love Photo Wall, which contains heart-shaped leaves where you can write your special love messages to stick on the Tree of Love. Furthermore, anyone who takes a photo of their message on the wall and shares it on Facebook, Twitter or Instagram with #WestinBahrain has a chance to win a night’s-stay-for-two at the Westin. The Mezzanine Lounge will be setting up private pods for an atmospheric and romantic dinner on Valentine’s Day. Each pod will be littered with rose petals, candles and have a romantic movie playing to enjoy over dinner. A four-course menu will be served, inclusive of a bottle of sparkling beverage. Afterwards, ladies will receive a complimentary gift. There are only five pods available, so reservations must be made ASAP. The dinner will take place between 7.30pm-11pm and costs BD79++ per couple. The Saveur restaurant is hosting a three-course menu decorated with rose petals and candles, with romantic love songs performed by pianist Hanna. The highlight of the menu is a dessert buffet titled ‘The Room of Love’. A ‘Lollipop Cake’ and a Valentine’s gift will be given to ladies afterwards. The menu will cost BD25++ per person. The Bahrain International Circuit (BIC) is offering Early Bird 15 per cent discount tickets for the 2015 Formula One Gulf Air Bahrain Grand Prix, scheduled on April 17-19. The offer is available until February 15 and is valid for BIC’s Main Grandstand and Turn One Grandstand. Main Grandstand tickets cost BD128 instead of BD150, while a Turn One Grandstand ticket costs BD85 instead of BD100. The BIC Early Bird Discount is also available for the Batelco Grandstand (BD108), University Grandstands and Victory Grandstands (BD54 each) at 10 per cent off. For further information on the Early Bird Discount or to make a booking, visit bahraingp.com or call the BIC Hotline on 17450000. Naval Support Activity Bahrain will conduct testing of the base Emergency Broadcast System today, tomorrow, Friday and Sunday. Testing times will be between 8am-11.40am and 12pm-3pm. It is likely residents and businesses near the base will hear voice testing as well as siren testing. These tests are part of normal operations and are not in response to any local or world events. Take part in a fitness challenge at the Elite Seef Residence & Hotel; a one-day challenge on Friday. All fitness addicts are invited to put their strength and athletic capabilities to the test at the hotel’s Kinetix health club. Fitness enthusiasts will be competing amongst each other for the highest number of push-ups, planks and crunches performed in a day, with the winners of each category winning a cash prize of BD200. Professional trainers at Kinetix will be available to assist and guide participants throughout the competition. The event will be hosted by International Federation of Bodybuilding and world class fitness champion, Sami Al Hadad.